The Washington Times is reporting today that “US Border Patrol agents have been ordered not to arrest illegal aliens along the section of the Arizona border where the Minutemen patrolled last month because the increase of apprehensions last month would prove the effectiveness of Minutemen volunteers. More than a dozen agents who asked not to be identified for fear of retribution said orders relayed by the border patrol supervisors at the Naco, Arizona station made it clear that arrests were not to go up along the 23-mile section of border that the volunteers monitored to protest illegal immigration. ‘It was clear to everybody here what was being said and why,’ said one veteran agent. ‘The apprehensions were not to increase after the Minutemen volunteers left. It was as simple as that. '” So the Border Patrol, according to the Washington Times, has been told to stand down because ‘an increase of apprehensions there would prove the effectiveness of the Minuteman volunteers.’ Now, wait a minute. Something about this confuses me. If they stand down and are being told not to arrest anybody, and that means more are going to get across the border than otherwise would, isn’t that also going to show the effectiveness of the Minutemen? 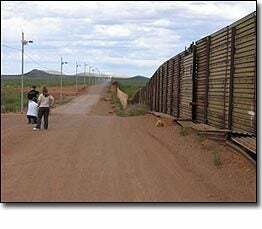 Because the Minutemen’s presence dramatically reduced border crossings along that 23-mile stretch. “Another agent said that the supervisors were clear in their intention to keep new arrests to an absolute minimum to offset the effect of the Minuteman vigil, adding that the patrols along the border have been severely limited. Border Patrol Chief David Aguilar at the agency’s Washington headquarters called the accusations outright wrong, saying that supervisors at the Naco station had not blocked agents from making arrests and that the station’s 350 agents were being supported in carrying out their duties. Tom Tancredo, Colorado Republican, yesterday said credible sources within the border patrol also told him of the decision by the supervisors to keep new arrests to a minimum saying he was angry but not surprised. Tancredo said, ‘It’s like telling a cop to stand by and watch burglars loot a store but don’t arrest any of them. It’s another example of decisions being made at the highest levels of the border patrol that are hurting morale and helping to rot the agency with within. '” Well, now, this is despicable if it’s true, but seems to me they can’t win. If they’re not going to arrest them, they’re going to get across, right? So you’re going to have more crossings, more illegal crossings than when the Minutemen were there, right? So that proves the Minutemen’s effectiveness. If they were to arrest them and announce the arrests and it was a lot, that would prove the Minutemen’s effectiveness. Maybe the game is this. Maybe the game is just to report a fewer number of arrests meaning this wasn’t a big part of the illegal crossings’ anyway; the Minutemen really didn’t do that much. There’s not that much activity here in the first place, because unless we get a number of people that get in illegally the fact that we have few arrests just by itself might indicate that there’s low activity there and that the Minutemen really had nothing to do with it in the first place. That’s probably what it is.